Ferntree Gully, originally ‘Fern Tree Gully’ because of the scenic gully now partly in the National Park of the same name, is mostly a large suburban area 29 km east of central Melbourne. The fern tree gully in the National Park runs along Ferntree Creek between One Tree Hill and the Upper Ferntree Gully railway station. The gully (now in Tremont) became an excursion destination in the 1870s, and its popularity increased when the railway was extended from Ringwood to Upper Ferntree Gully in 1889. Seven years before, the land around the gully had been reserved for public purposes, and the reservation was given the status of a national park in 1927. Upper Ferntree Gully is generally the eastern extremity of the locality. Its western edge is near the junction of Ferntree Gully Road and the Burwood Highway, at the Club Hotel, which had been the coach terminus for excursionists before the railway extension. During the 1870s there were two hotels, a post office and various selectors occupying land. Further eastwards timber-getters were accessing the forest, and the local population warranted building a school in 1880. Shortly afterwards shops, a bakery, a butcher and Wesleyan and Anglican churches were built. 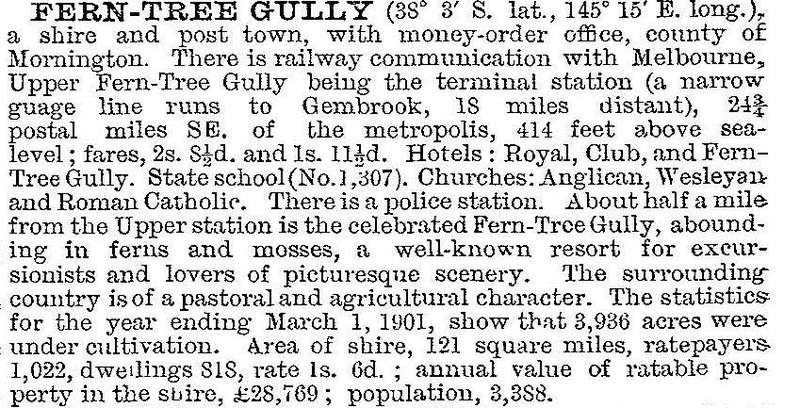 By the turn of the century Ferntree Gully had spread, caused partly by the railway line bypassing the old Club Hotel location. On 30 May 1889, the Shire of Fern Tree Gully was proclaimed, consisting of 390 sq km severed from the Berwick shire, and having a population of 750. Post-war urbanisation saw the building of a kindergarten (1949) a boys' technical school (1954) and the William Angliss hospital (1954), the last two in Upper Ferntree Gully. A second primary school was opened, at the western end of the locality, in the same year. By the early post-war years only about 20% of Ferntree Gully's workforce were in primary industry, and many workers commuted to Melbourne's industrial areas. Ferntree Gully had electric trains (since 1929) picture theatres and motor cars. There was a divide between the hills people and the subdividers down on the plains, and in 1954 the State Government enacted planning controls over excessive subdivision. Debate over severance of the plains from the hills extended from war time to the 1960s, and in 1963 the Fern Tree Gully shire was divided, creating Knox shire in the west, the boundary running between Lower and Upper Ferntree Gully. Fern Tree Gully shire included Bayswater, Boronia, Lysterfield, Scoresby and Wantirna, all of which were severed on 16 November 1963, to form Knox shire down on the plains. The severance included the western part of the Ferntree Gully township. The areas remaining in the shire included Avonsleigh, Belgrave, Clematis, Emerald, Ferny Creek, Kallista, Macclesfield, Menzies Creek, Monbulk, Olinda, Sassafras, Selby, Sherbrooke, Tecoma, The Patch, Tremont, Upper Ferntree Gully and Upwey. On 22 December 1964, the name was changed to Sherbrooke shire. Ferntree Gully’s western boundary is Scoresby Road, with entry points along Burwood Highway and Ferntree Gully Road which meet at Mountain Gate (see separate entry) and a large drive-in shopping centre. The railway line comes from a northerly approach, and there is a shopping centre at the station. Its congested location has given way to roadside retailing on Burwood Highway, which includes two supermarkets, quite near the old shire offices at Selman Avenue. Ferntree Gully has four State primary schools, a Catholic primary school (1936) and a Catholic boys’ secondary college (1965). Later shire census data is found in the entries for Knox City and Sherbrooke Shire.